Yue ware developed slowly over a period of almost one thousand years, from the Han dynasty to the early Song. The most primitive wares of the celadon type, thought to date from the 3rd century BCE, seem to represent the forerunners of Yue ware. While the kilns that produced Yue ware in the Han and Six dynasties periods have been found, the gap between the latter part of the sixth century and the first half of the ninth century has yet to be filled. No sites for the production of Yue ware in this period have been found yet. The most prolific and important group of kilns working in the latter part of the Tang period was around the lake of Shang Lin. (M. Medley, 'T'ang Pottery and Porcelain', London, Faber and Faber, 1981. p102) This piece is an example of the work of these kilns. In the repertoire of late Tang shapes, Yue ware ewers seem to have been particularly popular. 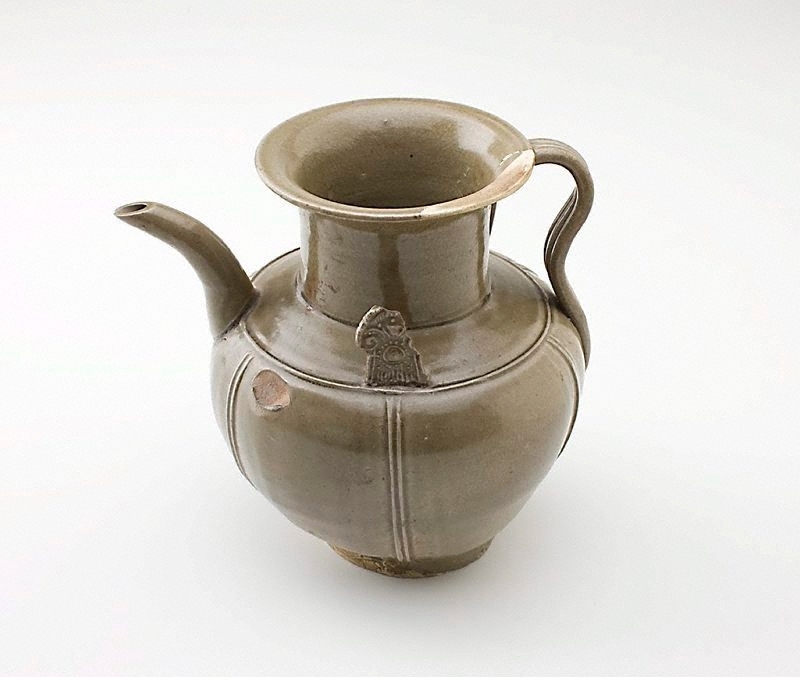 This piece, with its strap handle, ovoid body vertically ribbed, wide neck flared at the lip and rather awkwardly curved spout, is typical of a group of Yue wares dates to the late 9th-10th centuries. Unlike the burial wares of the Tang dynasty which had no ceramic successors, Yue wares were important for subsequent ceramic developments in China.